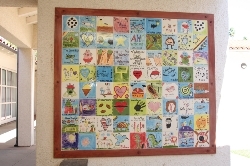 Valentine Elementary School has a long-standing commitment to educating the whole child. Our curriculum is designed to help students develop intellectually, emotionally, aesthetically, and socially. We encourage students to become active, engaged learners and responsible citizens. At each grade level our teachers challenge students and help them achieve academic and intellectual competencies. The arts are a critical and integrated part of our Valentine curriculum. Students learn the arts as discrete subjects, each with its own unique content, and, where appropriate, connect the arts to concepts and themes from the academic curriculum. "The arts are a dynamic presence in our daily lives, enabling us to express our creativity while challenging our intellect. Through the arts, children have a unique means of expression thatcaptures their passions and emotions and allows them to explore ideas, subject matter, and culture in delightfully different ways. Achievement in the arts cultivates essential skills, such as problem solving, creative thinking, effective planning, time management, teamwork, effective communication, and an understanding of technology." For each of the four arts disciplines- Dance, Music, Theatre and Visual Arts- our state content standards have identified five strands to guide our instruction: artistic perception; creative expression; historical and cultural context; aesthetic valuing; and connections, relations, and applications. At each grade level, kindergarten through grade five, content standards are specified for each strand. Our instruction and the experiences we plan for our students are guided by our goal to provide our students with the opportunity to gain competence in each of the four disciplines and five strands as identified by California State Board of Education. 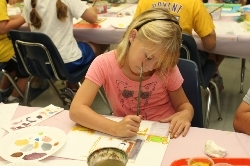 Visual arts instruction at Valentine is provided in a well planned, meaningful and focused way. 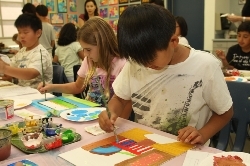 Standards-based visual art lessons are provided by our classroom teachers using our district adopted Art Curriculum and by our Art Specialist, Kaye Ogita. Our classroom teachers at each grade level use our art curriculum to teach visual arts vocabulary, the elements of art (line, color, shape, form, texture, space & value), principles of design, historical and cultural dimensions, and to help our students develop perceptual skills and the ability to identify aesthetic qualities in works of art. Our students then have the opportunity in the Art Room to apply the artistic processes and skills learned in their classrooms. 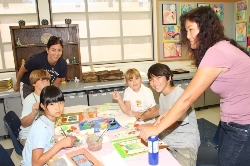 In the Art Room students are able to create their own original works of art under the guidance of our BRAVO Award Winning art instructor, Kaye Ogita. Our PTA generously supports the purchase of high quality art materials. 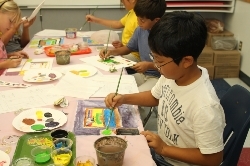 Our students are able to use a variety of media including pencils, paints, crayons, clay, watercolor, and tempera. Our Spring Art Festival held during Open House is an opportunity for every student in our school to have their artwork beautifully displayed. It is an event not to be missed! 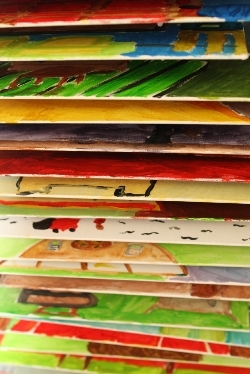 Parents, students and relatives are provided with the unique opportunity at our Spring Art Festival to order notecards using their own children's artwork. Our Valentine students in grades kindergarten through fifth grade participate in music instruction taught by our Music Specialist using the Spotlight on Music Instructional Materials for K-5. All of our students participate in performances each year to showcase the music skills they have learned. 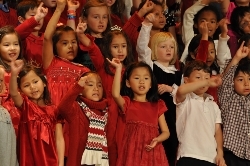 The complete Visual and Performing Arts Content Standards for California Public Schools for Dance, Music, Theatre and Visual Arts for Grades Prekindergarten through Eighth Grade are available at the link provided below.